I came upon this book quite by accident because it was recommended to me by my cousin's daughter. We were talking about books, as we often do, and I was asking if they had read Wings by Aprilynne Pike but I hadn't clarified the author so they thought I was talking about this book. After a bit of confusing conversation, we realized that we weren't talking about the same book at all, only different ones, but with almost enough similarities that it took a few minutes to notice that. I must admit I haven't read Wings by Aprilynne Pyke and my knowledge of that book in the conversation was going strictly off of Amanda's review of it. Perhaps, I'll get to reading/reviewing that one later. For now, I'll tell you about Jason Lethcoe's Wings and the Mysterious Mr. Spines. Isn't the cover art, well, amazing? I loved how the light reflects behind this beautiful lonesome looking boy. Okay, yes, he sprouts wings. The next thing he realizes is that his oddly unkind teacher, at the school his aunt insisted he attend, wants to cut it off. After this horrifying ordeal, Edward escapes into a realm of misunderstandings as he can't decipher what exactly he is or who he can trust. This leads to a suspenseful world of intriguing new characters, including that mysterious Mr. Spines, a silvery fox like Mr. Scruggs and many others that seem to have a defining characteristic about them. I have my own suspicions on many of them. 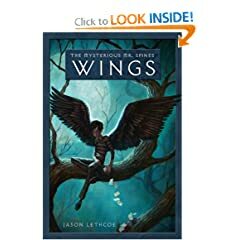 In the beginning, Lethcoe describes how he came about the idea to write this book simply by asking himself a simple question which nicely sums it up: "What would happen if you found out you were the son of a fallen angel?" It is simply written and may not strongly hold attention for adults yet I found it enjoyable plus it is short enough that it won't be terribly time consuming. I'm looking forward to Book #2: Flight. I would recommend it to younger readers who love fantasy. I think my kids might like this one. Cool cover. My gosh everyone seems to be writing about the same stuff lately, don't they? Now the names are even the same. Sounds like something Morrigan would like. I"ll mention it to him. I think it is definitely for kids. I hope they like it. Be sure to let me know what they think. I'm curious. It is weird and confusing how there is a lot of the same stuff out there right now. fyi, One thing a bit different about this fantasy was that no one was very pretty.